NOTE: THIS LECTURE HAS BEEN RESCHEDULED TO TUESDAY, JUNE 6, 2015 at 7PM. 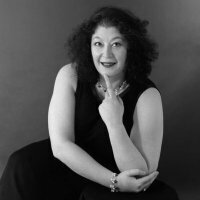 Ariane Ateshian Delacampagne will present her new book, Portraits of Survival: The Armenians of Bourj Hammoud. The author-photographer will speak about her work and exhibit many of her vivid photographs, as she tells poignant stories of survival and success. 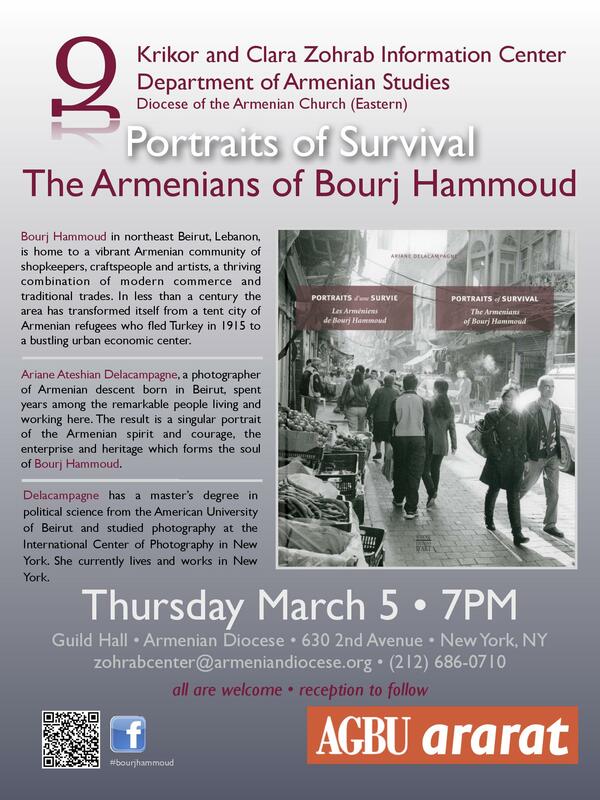 The event will take place on Thursday, March 5 at 7PM in the Guild Hall of the Armenian Diocese, 630 2nd Avenue, New York. Bourj Hammoud in northeast Beirut, Lebanon, is home to a close-knit, vibrant Armenian community of shopkeepers, craftspeople and artists, young and old, a thriving combination of modern commerce and traditional trades. In less than a century the area has transformed itself from a tent city of refugees — the Armenians who fled Turkey in 1915 and began flocking here in the 1920s — to a bustling urban economic center. It is here that Delacampagne, a photographer of Armenian descent, chose to focus her lens. She spent years among the remarkable people working and living here: the tailors and cobblers, embroiderers and clockmakers, jewelers and gem cutters, and the families. The result is an unforgettable portrait of the spirit and courage, the enterprise and heritage, which forms the soul of Bourj Hammoud. Ariane Ateshian Delacampagne is a noted photographer born in Beirut, Lebanon. Her latest work is a photographic exposé of the vibrant Armenian community of Bourj Hammoud, born from the ashes of the Genocide 100 years ago. Ariane Ateshian Delacampagne was born in Beirut, Lebanon. She has a master’s in political science from the American University of Beirut and studied photography at the International Center of Photography in New York. She currently lives and works in New York. The evening is free and open to the public. A reception will follow. For further information contact the Zohrab Center at zohrabcenter@armeniandiocese.org or (212) 686-0710. 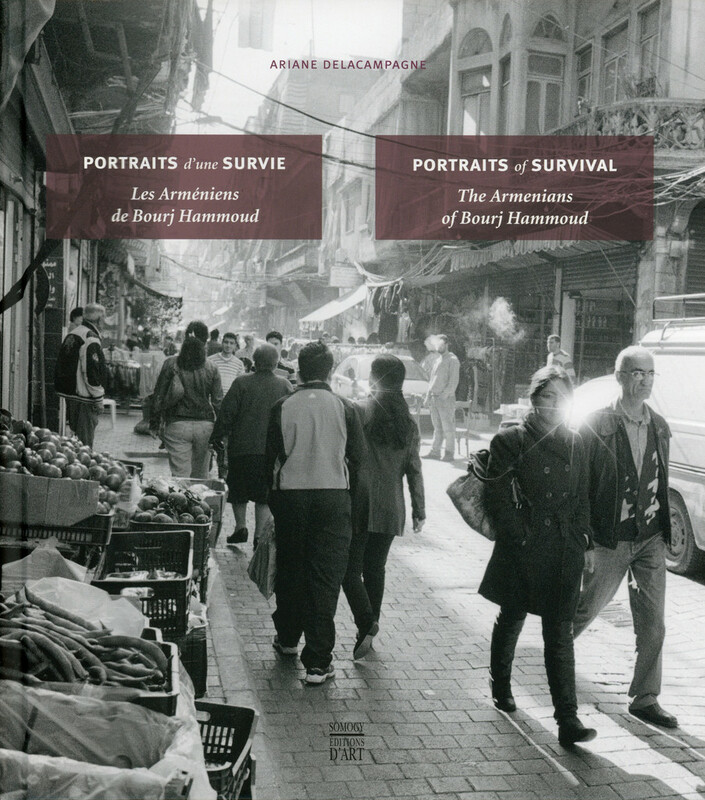 Portraits d’une survie: les Arméniens de Bourj Hammoud / Portraits of Survival: the Armenians of Bourj Hammoud (Somogy éditions d’art, 2014) represents Delacampagne’s most intensive project to date. This work has been the focus of solo exhibitions including: Survivants d’un génocide, les Arméniens de Bourj Hammoud (2007) at the French Institute, Barcelona; Armenians of Bourj Hammoud Today (2010) at the Centre Culturel Français, Beirut; and Les Arméniens de Beyrouth (2011) at Dupif Photo, Paris. Her photographs of the Armenian Sanjak Camp in Beirut were published in Nouvelles d’Arménie Magazine (no. 131, June 2007). Other exhibitions, publications and awards include: Duende: Visages et Voix du Flamenco (Archange Minotaure, 2007) with a text by Christian Delacampagne, with whom she also published Here Be Dragons: A Fantastic Bestiary (Princeton University Press, 2003), co-published in French as Animaux étranges et fabuleux, un bestiaire fantastique dans l’art (Citadelles-Mazenod, 2003). It was awarded the Cercle Montherlant-Académie des Beaux-Arts prize in 2003 and the Syndicat National des Antiquaires prize in 2004. Her earlier series on flamenco was the subject of three solo exhibitions: Duende (2008) at the Maison Française at New York University and Flamencos at Fort de Bellegarde (2007) in Le Perthus and at the École Supérieure des Beaux-Arts (2005) in Nîmes, France. The work was included in several group exhibitions at the Aperture Gallery, New York (2009); the Centro Andaluz de Arte Contemporaneo, Sevilla (2010); and Audi Villa, Beirut (2010).